Live theatre broadcasts are always exciting, and for Shakespeare fanatics nothing beats the RSC live screenings. The experience of sitting in a cinema hundreds of miles away from Stratford-Upon-Avon and yet still being able to experience the intimacy of an RSC production is a testimony to the advancement in technology which live theatre broadcasts have been experiencing ever since the RSC's Richard II was broadcast live in 2013. 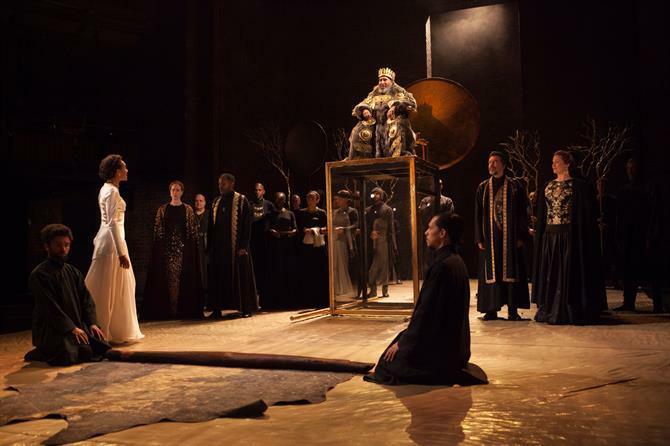 The most recent production to receive a cinema broadcast is King Lear, directed by RSC artistic director Gregory Doran. The production stars acclaimed British theatre actor Antony Sher as the titular character, alongside a myriad of exciting talents such as David Troughton as Glocester, Nia Gwynne as Goneril and Paapa Essiedu as Edmund. The production itself is not lacking in spectacle either. At the very beginning of the play Lear enters carried aloft in a glass box, swathed in fur and modelling a muted golden crown adorned with gilded feathers and acorns. Designer Niki Turner ensures that decadence juxtaposes coarseness at every turn during the first act, and warm golden tones give the piece an autumnal glow, which slowly ebbs away as the play goes on. Rather jarringly, this godlike grandeur is missing from the second act almost entirely, and paganist imagery is replaced with a harsh contrasting monochrome aesthetic. Despite this drastic switch in tone, the second act is really where this production of Lear comes in to its own, with the more clinical, harsh production design reflecting the sharpness and brazenness of the characters as their deeds become colder and more heartless. The cast are uniformly excellent in act two, and some outstanding performances more than make up for the slightly overindulgent first act. Nia Gwynn's Goneril is hard-hearted and yet vulnerable, Graham Turner plays an entertaining fool who at times seems almost like a foil for Sher's Lear, and Paapa Essiedu, whose mastery of Shakespearean language was showcased so well during his time as Hamlet at the RSC earlier this year, yet gives a compelling and captivating performance as Edmund. Meanwhile, David Troughton and Oliver Johnstone share several truly touching scenes together as Gloucester and Edgar. The pair's scenes as father and son are so delicate and intimate, with Troughton in particular giving an understated tour de force. Contrastingly, as the mad king, Sher gives his all and reaches for a level of godlike malignancy to match the empyrean design of the production, notably raising his hands to the sky as if to beseech the heavens at several points, at other points using the same melodramatic gestures to command those in his court. However, his Lear never quite reaches the thundering level of drama that the text promises, and several notable scenes feel a little too under emphasised. It has to be said though, that a less frenzied, more disturbed Lear is certainly a refreshing step away from the typical raving monarch seen in several past incarnations, and while a few of the grander scenes seem to miss the mark at times, Sher shines in the more internal moments, especially when he shares the stage with Troughton's Gloucester. While hardly the most subversive or revolutionary production of King Lear, several affecting moments make this piece an exciting one. It's definitely a play of two halves, and the drastic change in tone between acts may polarise some, but the consistently impressive performances are what really make Doran's production of King Lear stand out.